CBSE Class 10 syllabus for the current academic year 2017-2018 uploaded here. The Syllabus of Class 10 CBSE will guide you to understand the chapters and help successful learning. This Class X Syllabus covers all the subjects including Mathematics, Science, Social Science, English, and Hindi. CBSE Board Syllabus for Class 10 made your Exam preparation easier. Along with this CBSE Syllabus for Class 2017-18, you can also get information about all the other assignments and activities. Syllabus of Class 10 helping you to manage your time and study in a well-organized manner to gain good marks in CBSE Board Exam. Refer this CBSE Syllabus 2017-18 for Class 10 all subjects in the following section. Every Year CBSE Class 10 examinations will conduct for 80 marks. The institutes under Central Board of Secondary Education will conduct the annual exam for Class 10 every year. 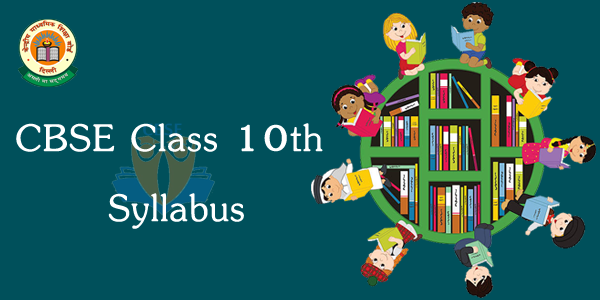 Let us have a look at the CBSE Syllabus Class 10 in the following section. But from this academic year onwards there will be compulsory board exam in class. So here we are providing the CBSE Class 10 Exam pattern for students free of cost without any errors. This Class 10 Exam pattern offers two types of assessment schemes for Students know as the Continuous and Comprehensive Evaluation (CCE). All Student of 10th Class will have to prepare the whole Syllabus for CBSE board exams. So This year students have to work harder to get a good score in exams. In CBSE class 10 languages the assessment (English and Hindi) of listening and speaking skills have a weightage of 20 marks. We Provide the CBSE Class 10 syllabus for all sturents. And these assessments conducted by schools itself. This Year Board had increased the Weightage to questions from textbooks. And it also Increased the no.of questions in Grammar Section. In class 9 and 10 Science, total no.of questions are reduced from 36 to 27 from last year. Three marks questions in the 10th Class CBSE Board exams are now reduced from 12 to last year. Now there will be only six questions of 2 mark each in practical section. Refer this Latest CBSE NCERT Syllabus of Class 10 for Vocational courses for the Academic Session 2017 – 2018. The syllabus of class 10 has a CBSE Sample Paper for Class X design for the upcoming board exam 2017 – 18. These vocational subjects offered as an additional (optional) subject in combination with five Academic core subjects. Click here to Download the restoring of class X board examinations. Check out this CBSE Class 10 syllabus for better time management. The CGPA of CBSE Class X will be calculated based on the grade obtained in five academic subjects and grade obtained in the vocational subject will be reflected under additional (optional) subject. CBSE Class 10th board exam is the milestones of every student’s academic journey. This Board exam will determine Students career decision of becoming an Engineer or a Doctor. A Clear understanding of any subject along with a strong foundation will enable one to have a better grasp on these core subjects like Physics, Maths, Science etc. To do so, our team at CBSE Guide will provide you the expertise study material. You can also get the CBSE Sample Papers for Class 9, 10,11 and Class 12 along with strategic study plan. To ensure that the all students are able to develop their important subjects on various topics. We at CBSE Guide has come up with Math, Physics, Chemistry, and Biology Syllabus for CBSE Class 10 which will help students grasp easily. Here you can get a detailed structure of the CBSE Class 10 Syllabus 2017-18 pdf has given. This CBSE Syllabus for Class 10 will give a clear idea on the subject related topics like solving the problem. Check out this CBSE Class 10 Exam Syllabus for Better Time Management. One You know about the topics covered it made easy for your exam preparation. You will have a clear idea about which chapter has more weightage and according to this, you can give more time for that particular topic. For Information regarding the CBSE Syllabus updates, stay tuned to CBSE Guide.